Some of you who have found this blog from my blog may know that I try to support those people engaged in the battle against cancer. I hope soon to participate in a Walk myself, but for now I try to donate, support other people on theirs, and things along those lines. So when I saw that author Sylvia Ramsey does outreach and advocacy for sufferers and survivors of a lesser known form of cancer, I really hoped she would write a Made it Moment, and introduce us to her work on many fronts. Thank you so much for inviting me to be interviewed on your blog. It is an honor. I put a lot of thought into whether or not I had made it. This journey was quite a task, but it was a fruitful one as well. I don’t think I have “made it” yet, maybe never will, at least not in the way that many people define, “made it”. However, if I can do something that helps someone out, or if I can make a difference for others…I consider it the best “made it” of all. As a non-traditional student who was the mother of teenagers when I got my bachelors degree, and again when I earned my graduate degree. I made it when I was given my first teaching contract. As a teacher, I have made it many times. I “make it” every time I see a student succeed. I “make it” every time one of them fulfills their dream. I really “made it” when I set up my Facebook account, and by that evening, over 50 of my very former students found me. I made it through eighteen years of caregiving to my first husband. One of the last things he said to me before he passed away was, “No one could have taken better care of me than you”. I made it when I survived bladder cancer. Being part of creating a nonprofit foundation, the American Bladder Cancer Society foundation, and their website for bladder cancer survivors and caregivers was a “made it” dream come true. I make it every time I can be there for someone who has been diagnosed with bladder cancer, and needs someone to talk to who has gone through it. As I look back over the years, there have been many “made it” moments in my life. I made it when I was asked to be the guest speaker for the White House Communications Agency’s observance of Woman’s History Month. Even in writing, there have been several moments that stand out. A few of those made it moments occurred when I was first published in a professional journal, when my first poem and short story was published, and the many times I have been asked to come and perform my work. I was performing some of my poetry at an open mic, and I had no idea there was a small publisher present. After the event was over, this person asked me if I had more poems, and when I said I did, the individual asked if they could read some of them. After reading the poems I had shared, they wanted more. Finally, they asked if they could publish them. That was the origin of my first book, Pulse Points of a Woman’s World. That was also when I began an earnest quest and dream for the bladder cancer foundation to become a reality. “Made it” to me is not the money, nor the fame. Making it is all those things you get in return when you give of yourself to others. My books will never be in Oprah’s book club, and that is okay, but every one that someone buys is helping someone else. Knowing that my writing can help others is really what matters the most, and each time one sells is a made it moment for me, and for those it helps. Sylvia began writing news and feature articles for a small town newspaper in Southeast Missouri at the age of nine, encouraged by a nurturing news editor. Over one hundred of her short stories and poems have found their way into literary magazines. She has been a featured poet in several literary journals, and her writing has extended into the realm of research in the field of Human Communication and been published in journals such as The Arkansas Speech Association Journal, and The Speech Teachers Association of Missouri Journal. One of the joys of having a blog–and of the web in general–is “meeting” people I never otherwise would have. Literally never, in the instances where we come from different states, or even countries. Sometimes in retrospect it’s hard to track the circuitous paths that lead to these meetings, but I do actually recall the chain that brought me to a post by Geraldine Evans, where I caught sight of her absolutely spectacular book cover. Please take a look at it–then read what Geraldine has to say about making it. My first ‘Made it’ Moment was the acceptance letter for Land of Dreams, after six long years and six rejected books-worth of trying. Alas, there was a sting in the tale. Well, two stings actually: The discovery that the last page was missing from this, my first published book and the rejection of my follow-up romance. My next ‘Made it’ Moment was when my very first crime novel, Dead Before Morning, was plucked from Macmillan’s slush pile and published in hb and pb both in the UK and in the States. There was even a sniff of interest from a Los Angeles film company… The latter came to nothing as these things generally do, but I went on to publish another three books in the Rafferty series with Macmillan. They were then taken over by a firm of German publishers and I was given my marching orders. There followed a second six year period when I received nothing but rejections. But, phoenix-like to the last, I rose again, when one of the agents to whom I had sent Up in Flames, the first novel in my second series, rang me. As it turned out, she not only placed that novel with Severn House, she also placed Absolute Poison, the novel rejected by Macmillan. She also sold Reluctant Queen, my first historical about Henry VIII’s little sister, Mary Rose Tudor (written under the name Geraldine Hartnett), to Robert Hale. Altogether Vanessa, my agent, has gone on to sell Severn House twelve other novels, ten in my Rafferty & Llewellyn crime series and a second in my Casey & Catt crime series. Perhaps, after all that, my best ‘Made it’ Moments, have been those brought about by readers throughout my publishing career, whether I was in or whether I was out, those lovely people – the readers, who take the trouble to write in about how much they loved a particular book or particular characters. Truly, those are the ‘Made it’ Moments that most inspire. Geraldine Evans has been writing since her twenties, though only began to get novels published halfway through her thirties. As well as her popular Rafferty & Llewellyn crime series, she has a second crime series, Casey & Catt and has also had published an historical, a romance and articles on a variety of subjects–Historical Biography, Writing, Astrology, Palmistry. She has also written a dramatization of Dead Before Morning, the first book in her Rafferty series. She is a Londoner, but now lives in Norfolk England where she moved, with her husband George, in 2000. Deadly Reunion is her eighteenth novel and fourteenth in the humorous Rafferty & Llewellyn crime series. She is currently working on the next in the series. The books showcased here on Suspense Your Disbelief are ones I hope will appeal to a broad range of readers–and book lovers have the most varied tastes of any group I’ve ever known. Most of you know that I don’t usually review books–I leave that to those who have a great talent for it, everyone from Oline Cogdill to Kevin Tipple, and many, many others inbetween. But every now and then a book just happens to be one that I’ve adored, that turns me on to a whole new-to-me writer, even one that changes my life in some way–at least during the time that I’m reading it. One that makes me, as a writer, sigh and say, I wish I had written that. Dave Zeltzerman’s THE CARETAKER OF LORNE FIELD, which I read on my birthday this year, is a novel–small, lovely, chilling–that did all four. You can imagine how eager I am to read this next book of Dave’s, and to introduce him all to you. Thank you Jenny for inviting me to contribute here. Like other guests, I don’t feel as if I’ve made it yet, more as if I’ve had a series of ‘getting closer to making it’ moments. In my case (and I suspect other writers also) it’s because my definition of ‘making it’ keeps changing, and the whole idea of making it becomes more of a journey than one particular defining moment. I’ve been writing fiction since I was in fifth grade, but for a long time I had no goals or thoughts of ever making it. I always read a lot, and I loved writing—loved the storytelling and the creative aspect of it, but my main interests were in math and computer science, and a career as a writer never entered my mind as a possibility. I followed the path that seemed most obvious to me and I majored in Applied Math and Computer Science in college. While I still read a lot on the side and still worked on short stories, I never entertained the thought that I could ever be published. In 1990 while I was working as a software engineer something changed. For the last ten years I’d been reading mostly crime fiction, and in my own writing I was trying to ape Ross Macdonald’s style and not doing a very good job of it. When I discovered Jim Thompson’s noir classic, Hell of a Woman, it was almost like a religious experience. He did things that I’d never seen before—not just in telling the story from the mind of a psychotic killer, but in the chances he took and in the rules he broke. But what struck me the most was how he made it all work so brilliantly, and I started seeing how I could rework a failed story idea into a novel and do it in a way that would be exciting for me. For the first time I had a goal for ‘making it’, which was writing this book (which would become Fast Lane) and seeing it published. While I was working on this book I was beginning to find my own voice instead of aping other writers, and along the way I sold my first short story submission for $35 to New Mystery Magazine. This $35 sale was maybe one of the most exciting moments in my writing life, and if I didn’t have my other goal, this probably would’ve been my making it moment but instead it was one of those ‘feel good about it’ moments. A year later I finished Fast Lane, and it would later take me 12 years to sell it, and that would be to an Italian publisher, and by that time my making it goal would’ve changed to something completely different. Let’s fast forward to 2005. At this point I had written 3 other novels: Bad Thoughts, Small Crimes and Outsourced, and was having no luck in selling any of them, although I was getting close calls with Small Crimes and Outsourced with editors taking them to their boards with the hopes of acquiring them. Even though Outsourced didn’t have a publishing home yet, my agent was able to get a top film agent interested in it, and he started pitching it to the major studios giving me another of those ‘getting closer to making it’ moments. In 2006 I sold Small Crimes to a top London publisher, Serpent’s Tail, and early on that would’ve been my making it moment, but not any longer. In 2007 I started selling short stories to Ellery Queen Mystery Magazine and Alfred Hitchcock Mystery Magazine—again, several years earlier this would’ve been my making it moments but now they had become more ‘feel good about it’ moments. In 2008 Small Crimes is published, it gets a starred review in Publisher’s Weekly comparing it to the best of James Ellroy, a rave review in The Washington Post, more rave reviews in other papers including my hometown Boston Globe, is named by NPR as one of the top 5 crime and mystery books of 2008 and is picked by the Washington Post as one of the best books of 2008. I also sell French and Italian rights, as well as two more books to Serpent’s Tail (Pariah and Killer). Any of these are far more than I expected when I started writing, but at this point I’m getting jaded and these had become only more ‘feel good about it’ moments. Over these last two years I see four more books published, get more foreign deals, more rave reviews in major newspapers, both here and in the UK, Australia and South Africa, have Pariah make the Washington Post best books of 2009, make many other best of the year lists, see Small Crimes listed as one of the 100 best crime novels of all time, get a film deal for Outsourced with a major player, see The Caretaker of Lorne Field get nominated for a Black Quill Award for best dark genre book of the year with other nominees Stephen King and Peter Straub, win a Shamus Award, other awards also, and I still haven’t have had my making it moment as my destination keeps moving further away. I probably never will have my one defining making it moment because the struggle to make it keeps me stretching and growing as a writer, and that’s probably the reason my destination keeps moving further and further out there. But all of this has given me enough of those necessary good moments to keep me on my journey. Dave Zeltserman began life as a software engineer before selling the Italian rights to his first novel. He’s had stories published in Ellery Queen and Alfred Hitchcock magazines, and is the author of nine other collections and novels. Dave lives in Boston. He holds a black belt in Tiger-Crane style of Kung Fu. Me, too, I wanted to say when I read the first line of today’s Made It Moment. That’s two for two this week. I wonder what you’ll think? Although I’ve had nice public recognition for my novels (winning five contests across the country), I’ve always registered success by how my story touches individual readers. After my novel BROKEN LACES was published in 2010, the first feedback I received was from a “real” reader who said that he’d stayed up until 2:30 in the morning to read my book straight through. He jokingly complained about how I’d ruined his workday by causing him to lose sleep. What a great treat for an author! Have I made it? For these readers, BROKEN LACES provides a real world that they can disappear into and where they can experience honest emotional reactions to the characters. It doesn’t get any better than that. Rodney Walther is the award-winning author of the novel BROKEN LACES, an emotion-packed story which features Jack “The Cannon” Kennedy, a suburban workaholic who doesn’t understand the importance of family until he faces life as a single parent. Set in a fictional suburban Little League, BROKEN LACES explores the importance of father-and-son relationships, the struggles of shared grief, and the redemptive power of baseball. A long-time baseball coach, league director, and volunteer umpire, Rodney knows firsthand all the crazy characters that populate the Little League landscape. 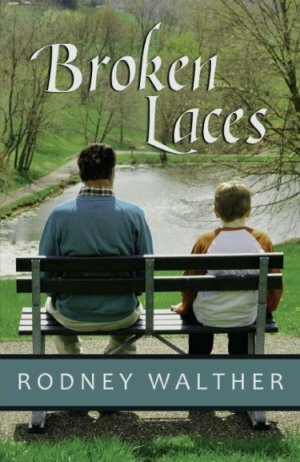 You can learn more about Broken Laces (including how to purchase it in either paperback or e-book format) at http://www.rodneywalther.com. But just in the past couple of days, I’ve received several emails from readers asking me how I select Moments, or writers to feature on my blog. Do I know the people? Do I read their books and like them? The answer is, I don’t. Or rather–you couldn’t. Have a sense. I want Suspense Your Disbelief to be a community for authors, writers, readers, and publishing folks of all stripes and colors. Polka dots even. Every so often, if a book just blows me far and away, I may say so. Or I may not. Oftentimes a Moment-er is brand new to me, in which case I try to put his or her book on my TBR pile. I have discovered many new-to-me authors this way. And some new-to-the-world ones, too–a unique pleasure. If you have something to say about this brave new world of publishing, or this almost-as-old-as-the-dinosaurs world of writing (storytelling), please contact me. I don’t have to agree with what you say. If you scroll through the posts you’ll see some of the biggies covered in ways that may or may not link up with what I personally believe. Politics. Human rights. Religion. Parenting. Suspense Your Disbelief is for everyone who has a respectful, thinking take on something related to books. Please welcome John Desjarlais to the blog. John knew he’d made it in just the way that would have such meaning for me…But I’ll let him tell you all about it. I knew I made it when my book kept an editor up all night reading. She literally could not put the manuscript down. She had other urgent projects in her to-do list with higher priority, and she gave my book a quick glance after I emailed to inquire politely about the manuscript’s status (not having heard from her in a good while). One glance was all it took. One read-through without stopping. She emailed the publisher very early in the morning (with a cc to me) urging an immediate contract. This was VIPER (forthcoming in March 2011), the sequel to BLEEDER, the contemporary mystery this editor had acquired the year before. Sophomore books are often more difficult to write and – according to many in the biz – are weaker than the debut. But VIPER required very little editing, whereas BLEEDER needed more work. That story showed great promise and was in pretty good shape, but the editor skillfully spotted the gaps and gaffs and there was some serious re-writing to be done. Not with VIPER. Hardly a line changed. This was nearly miraculous, since VIPER was much more challenging than anything I’d done before. The protagonist, Selena De La Cruz, is a 30-something Mexican-American woman coming to terms with her bicultural identity and her place in a man’s world. So much could have gone wrong – not to mention all the potential pitfalls of mystery writing. Apparently, it all rang true and there was no misstep to trip up her all-night marathon. “More compelling than BLEEDER!” she told the publisher. A former producer with Wisconsin Public Radio, John Desjarlais teaches journalism and English at Kishwaukee College in northern Illinois. His first novel, The Throne of Tara (Crossway 1990, re-released 2000), was a Christianity Today Readers Choice Award nominee, and his medieval thriller, Relics (Thomas Nelson 1993, re-released 2009) was a Doubleday Book Club Selection. Bleeder and Viper are the first two entries in a contemporary mystery series. A member of The Academy of American Poets and Mystery Writers of America, John is listed in Who’s Who in Entertainment and Who’s Who Among America’s Teachers. If your kids are slightly older and you’d like to expose them to the world of jazz, taken easy–or just have a fun night out yourself–I’ve heard great things about Bob Devos who’s playing on Market Street in Newark this Friday the 18th–no cover!! If you go, please come back and leave a comment. I’d love to hear how your night went. I am very happy to welcome Tina Whittle to the blog–it’s always fun to feature a writer whose work I can discover along with all of you, and Tina’s debut novel looks like a doozy. Her Moment also happens to be the most poignant I’ve ever had the privilege of reading–and this forum privileges me with every post. Read on and you’ll see what I mean. We all remember our “aha” moments — the call (finally!) from the interested publisher, the advance check in the mail, the first time someone introduces you as a writer. These are my “made it” moments, for sure. And yet as identity-altering as these slices of memory are, none is as precious as the hour last week right before Dress Like Your Favorite Author Day at my daughter’s school. We debated sending her as Edgar Allan Poe (which needed only a stuffed raven and a fake mustache) or perhaps one of the Greek dramatists (which needed only a sheet). In the end she decided to go as . . . me. The ingredients were simple — black sweatpants, flip-flops, glasses shoved into a nest of bedhead, the ensemble topped with a t-shirt my mother gave me which reads “Careful, or you’ll end up in my novel.” A stack of crime-writing research books and a mug of coffee completed the portrait. And yet what I hold closest to my pitter-pattering heart is watching this girl child of mine — my sweet brilliant dear daughter — be so proud of me that she was willing to “be” me for a day. To know that I inspire her. To know that if nothing else, I have been an example of persistence, that I have demonstrated the pragmatic faith of those who try again. And again. And yet again, one more time again. Tina Whittle is a mystery writer living and working in Southeast Georgia. THE DANGEROUS EDGE OF THINGS, her first novel, debuts February 2011 from Poisoned Pen Press. Set in contemporary Atlanta, this is the first book in a series featuring gun-shop owner Tai Randolph and corporate security agent Trey Seaver. Tina’s short fiction has appeared in The Savannah Literary Journal, Alfred Hitchcock’s Mystery Magazine, and Gulf Stream, which selected “Lost Causes and Other Reasons to Live” as the 2004 winner of their Mystery Fiction contest. Tina is also a columnist and feature writer for The 11th Hour, a local alternative newspaper, and a professional tarot reader. When not writing or reading, she enjoys golf, sushi, mini-pilgrimages, and spending time with her family (one husband, one daughter, one neurotic Maltese and three chickens). I am very happy to welcome mystery author Peg Herring as she travels the blogsphere. Here she explores the way language travels over time. The first part of this post can be read at former independent bookseller Leila Taylor’s terrific blog. It’s a must-read for language lovers and history buffs alike. Plus, there’s a very neat contest and potential giveaway for those who leave a comment! Thanks, Jenny for the guest spot! Would you be offended if I called you a “wench” or a “knave”? Both terms were once used for people of the lower class, and they would have taken no offense at being called what amounted to “servant”. However, such terms were insults to the nobility due to their pride of class, so today, a wench is a woman of loose morals and a knave is a dishonest man. What was once simply descriptive has become pejorative. Language scholars call that “lowering”. Oddly, it’s hard to keep any word associated with the sense of smell from lowering. At one time, “stink” and even “stench” were everyday words for smells, and “reek” is the OE word for “smoke”. Even “smell” is more negative than positive today unless you combine it with other words: “smells good” or “smells like–”. We choose words like “fragrance” or “aroma” to convey that a smell isn’t bad. In Shakespeare’s time, “nice” meant “silly”, so when Benvolio speaks in ROMEO AND JULIET of a “nice” quarrel, he means there was no reason for it. You wouldn’t mind being called “nice” now, so that word is said to have “elevated”. Similarly, “naughty” in Elizabethan times meant “evil”, but now we use it for mild misbehavior, particularly for small children or little sexual peccadilloes. Some words “widen” in meaning, that is, they once meant a specific thing and now are more general. A wonderful example is Guy Fawkes, who tried to blow up the British Parliament in the 1800s. People began celebrating the day the plot was foiled by making and hanging effigies called “guys”. From that, a male who was acting like a dummy was called a “guy”. The word elevated as it widened over time so that all males were called “guys” and now, it’s pretty common to address a group of both males and females as “you guys”. From one individual to as many as you like: that’s major widening. Words also “narrow” in meaning. Terms that once meant a lot of things become more specific. “Meat” was once the term for all food; think “meat and drink” in old poetry. (To name what we call meat, medieval folk would have said “flesh”, but you didn’t want to know that, did you?). “Deer” was a general term for wild animals, “corn” for all grains, and ‘hound” for all dogs. “Starve” once meant to die from any cause, and an “undertaker” was anyone who began something. It makes me wonder what words of ours our descendants will use differently. Certainly words like “phone” and “computer” are undergoing substantive changes. Will your grandchildren believe that either of these things was once connect to a wall by means of a plug? The term “phone”, already shortened from “telephone” by popular use, seems likely to widen to encompass all kinds of devices that do much more than “hear from afar”. Change is inevitable, but don’t try to convince your girlfriend that it’s okay that you called her a “hussy”. After all, it just meant “housewife” to the folks in the eleventh century! The Poser-Name an historical series/book where the protagonist uses early CSI methods. The Prizes-Weekly prizes (your choice of THE DEAD DETECTIVE AGENCY in e- or print format) drawn from the names of those who comment on the blogs as we go. Comment once/day, but the first commenter each day gets entered twice in Saturday’s drawing! The Pitch: THE DEAD DETECTIVE AGENCY, First in The Dead Detective Mysteries, paranormal mystery. Tori Van Camp wakes in a stateroom on a cruise ship with no memory of booking a cruise, but she does have a vivid recollection of being shot in the chest. Determined to find out what happened and why, Tori enlists the help of an odd detective named Seamus. Together they embark on an investigation like nothing she’s ever experienced. Death is all around her, and unless they act quickly, two people she cares about are prime candidates for murder. Read more about this book and the author at http://pegherring.com or buy the book at http://www.ll-publications.com/deaddetectiveagency.html. Peg Herring writes historical and contemporary mysteries. She loves everything about publishing, even editing (most days). Peg’s historical series, The Simon and Elizabeth Mysteries, debuted in 2010 to wonderful reviews. The second in the series will be available in November from Five Star. I told you guys. I feel I have to keep the backstory coming right now. But I realized that in so many of these posts there’s someone hovering, unseen, in the background, and I don’t know if I’ve given her her due. Or, for your sake, dear readers, spoken enough about how to get one of these rare birds to alight. I’m talking, of course, about literary agents. I’ve worked with three over a period of, well, a lot more years than that, and they have been to a one, committed, devoted, enthusiastic, and selfless. How else can you explain someone working–for free–to further your dream? Even when my relationship with agent #2 ended on an abrupt note, all of the above still applied to her efforts on my behalf. One day soon, I hope to send gifts just to say thank you. So, how do you find a literary agent? We’ll be talking about exactly that in the course I’m teaching this Sunday, but I thought I’d give a quick and dirty rundown here, before allowing the backstory to finally catch up to mostly present tense. Let’s say first and foremost that you must make sure you have a great (not just good), polished manuscript that a decent number of people outside your family (unless your family happen to be your toughest critics) love and said they can’t put down. #1: Cold query. Websites, print guides, industry rags (such as Publishers Marketplace) are all good resources. But the single best way I’ve found to cold query is to read the acknowledgments in books by authors you admire and contact their agent. If the author is very famous, this won’t work. But if you have a handful of debut authors or mid-listers in hand, you should get a better than average hit rate using this method. #2: Conferences. There are several where meeting agents is part of the point. Backspace. Wilamette. Check ‘em out. Conferences have the advantage of some face-to-face time. The disadvantage is that everyone there is clamoring for that time and people tend to blend into a blur for an overwhelmed agent. However, if you meet an agent at a conference, your query will almost certainly be looked at. This isn’t necessarily true for a snail mailed query–and even less true for an emailed one. #3: Personal referrals. This is often the most effective method–although not even the heartiest referral will make an agent take on a project s/he is lackluster about; but it will get you read, and often faster–and yet the hardest to pursue. After all, not many of us know well-positioned authors with great agents. Still, you can try to grow a place yourself within a network of writers. And even if they don’t have an agent to refer you to, they may know another writer who will. So how can you meet writers? Again, go to conferences, where authors appear. Go to author events, such as reading or signings. Take classes with published writers. Keep in mind that this is not a “method” to “get” an “agent”. Instead it’s a way to begin entering the world you hope to be part of someday. And who knows where that might lead? So what happened after I signed with Angel–I mean, agent–number three? She sent out the novel my second agent had been submitting, and we had a few editors hold onto it “with interest”. Because I knew how the business worked a little better at this point, I was hard at work on a new novel. Many of you may know that just because your agent likes one book of yours is no guarantee she will like another. Luckily my agent did. And within a month or so, no fewer than five editors were interested. So what happened? Why is that book not out, or soon to be coming out? One more backstory post, I swear. Then–said with a dramatic swishing of curtain cloth–all will be revealed.